We Have an Exciting News to Share! Each reward has its own merits but there is something special and magical to be rewarded by your fans. It's as though all your hard work has finally paid off. We thank the thousands of our fans who tirelessly voted and made StoryTruck their #1 choice. 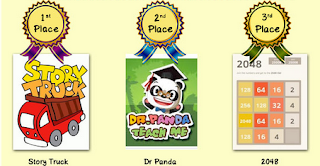 We are elated to share that all you fans have chosen StoryTruck as your #1 choice in mobile apps in the RivoKids Parents and Kids Choice Awards 2015. Way to go StoryTruck fan army! We started StoryTruck with a very simple idea. 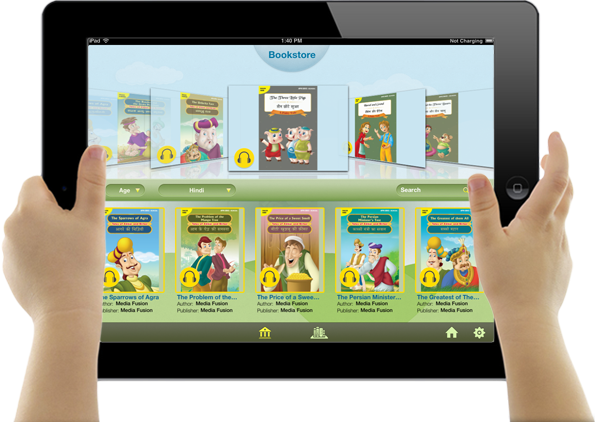 Our idea was to make it very easy for parents to find high quality children's books without breaking their bank. After a lot of brainstorming we felt digital was the right way to go. We are glad we did so because with more mobile devices and better Internet connections, we are able to reach many corners in India where it would not be cost effective to setup a library. We also have given an opportunity for the Indian diaspora in the middle east, Singapore, France, UK, USA and every country in between an opportunity to stay connected with our culture and language. We receive several fan mails from many of you regularly but being voted #1 has truly brought in an additional adrenaline rush inspiring and compelling us to work harder. If you haven't yet tried StoryTruck, give it a spin now. We have a seven day free trial on all platforms. 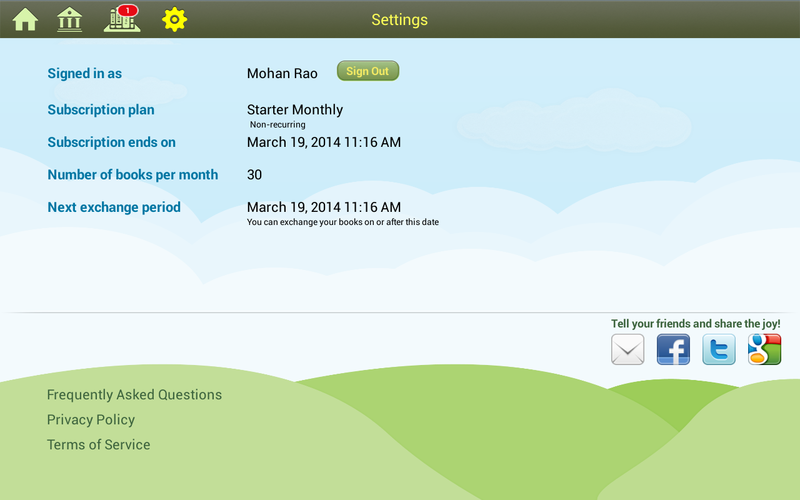 Signup on the web or download one of our free apps. We are humbled by your support! Thank you. What's the best way to teach something to a child? Tell a story! Storytelling is a powerful medium by which complex matters can be conveyed with simplicity. 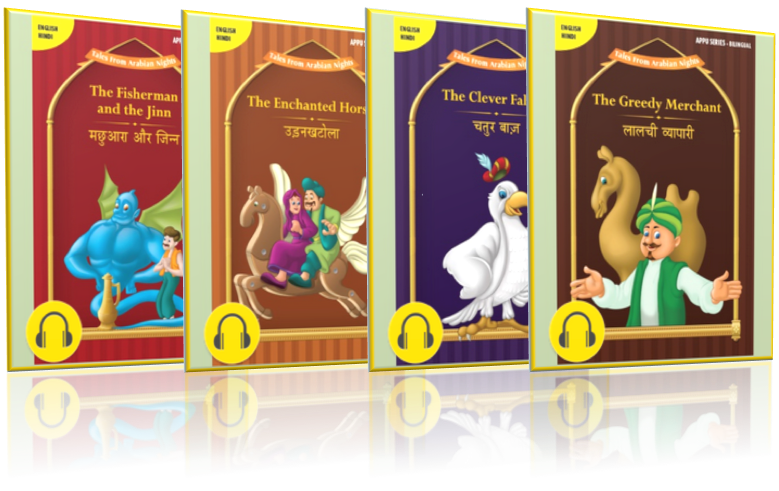 Panchatantra tales is a collection of such stories that help children differentiate the right from wrong, define honesty, loyalty, kindness, meanness, friendship and various other traits. 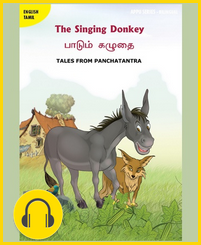 Our new Panchatantra titles are richly illustrated and soothingly narrated to help retain the attention of our young listeners. It's free to sample the first four pages of any book either on the website or within the app. Just tap on the book or the yellow headphone icon in the book! With our most recent update to our Android app, our users now have the ability to purchase subscriptions from within the app. You can zip through the purchase process in less than ten seconds with no forms to fill! Hurray! We hear you on that and... you are welcome! StoryTruck works on iPad, more than 4000 Android devices and the web. Users can get access to more than 400 books on the platform for a small subscription fee. The introductory pricing on Android is as low as $1.99 which gives access to all the books for a month. A 12 month subscription is even more attractively priced at only $9.99. Download StoryTruck App and subscribe today! Our long awaited Android App has arrived! It follows the familiar iOS interface with a few enhancements. Download the Android App today! To celebrate our Android launch we are also giving away a one year subscription for only $0.99. To get the deal simply visit www.storytruck.com and click on the "Unlock $0.99 Deal" on the sidebar. 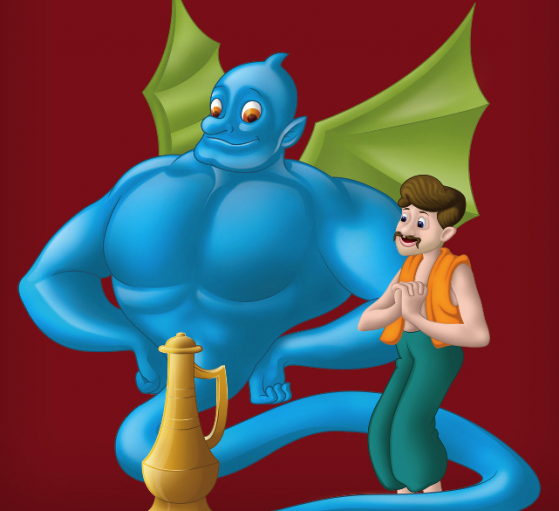 Arabian Nights on StoryTruck Now! 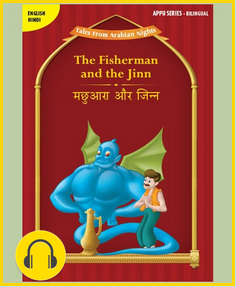 Our Arabian Night collection consists of ten unique stories in four different languages with perfect illustration and narration to captivate the attention of every child. Add them to your library today and we are sure that they will listen to them over and over again. Try these samples now or browse all newly added books. 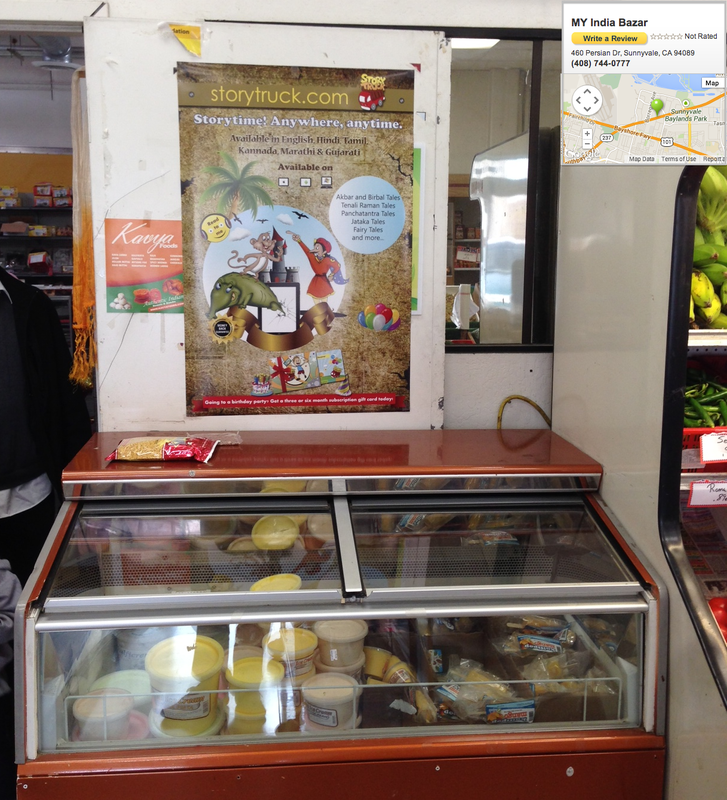 We are excited to announce that StoryTruck gift cards are now being sold in select Indian grocery stores in the US. They are available in three different variations. This is our six month subscription and gives you access to unlimited books for six months. 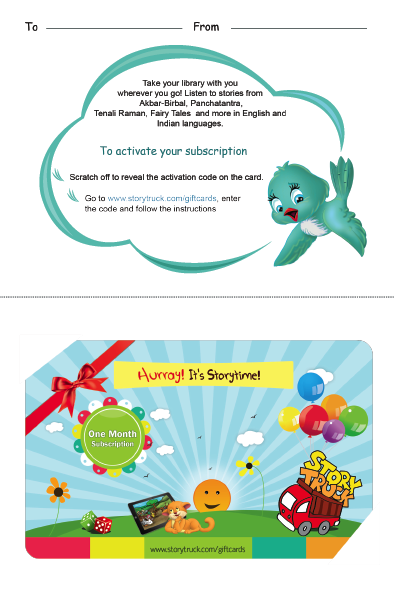 This is our three month subscription and gives you access to unlimited books for three months. This gives you access to 30 books and is valid for a month. This is great for goodie bags! 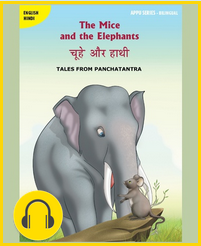 Panchatantra Tales on StoryTruck Now! Who doesn't love stories from Panchatantra? Children love them because the stories are short and cute while adults love them because there is moral in every story. While reading these stories you can't help but notice that these morals and lessons apply to our everyday lives. Ever wondered how these tales came into existence? Well, there are many variations on this story too but the most popular one says that a king in southern part of India was very disappointed with his three sons. The king thought that his sons were not smart enough and they would bring him dishonor. His ministers one day suggested that the king should send his sons to be trained by a well known scholar, Vishnu Sharma. The king soon summoned Vishnu Sharma and requested him to educate and train his three sons and turn them into great scholars. 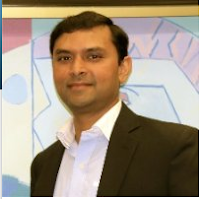 Vishnu Sharma took up the challenge and used the storytelling medium to educate and impart wisdom in his disciples. 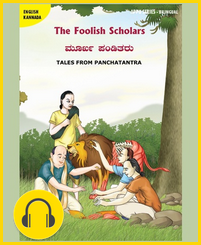 These stories are popularly called as Panchatantra today.